Including movement into an already existing lesson plan could make a world of difference to the receptiveness of your students. For example, when teaching your students about grammar you can use body movement to represent different punctuation markings. While you read a sentence aloud, each time it needs a comma the students clap their hands, and when it is missing a period the students stomp their feet. This allows for the students to hear where the punctuation markings belong and gives an opportunity for the entire classroom to participate. Incorporating rhythmic patterns into already existing lesson plans can help your classroom stay engaged because not only are they having to focus on the correct answer, but they are also focusing on maintaining the correct rhythm. Another example of integrating movement into lesson plans is having the students use their imaginations and act out information. For example, in a math class, students learning about multiplication can be asked to demonstrate how multiplication works through a skit. This not only allows them time to think about the value each equation equals, but why and how the equation receives the correct answer. There are endless possibilities when integrating movement into your lesson plans. Recess has become a way of the past, depending on your school district. Students are expected to sit through long hours of teaching without time to rest their brain. This can result in an unfocused and rowdy classroom. Designating a specific time for students to take a break is a useful approach for keeping a healthy classroom environment. A brain break does not always have to be the time for students to talk freely among peers or run around the playground. There are various creative approaches that can be used when deciding what type of break would be best for your classroom. For example, designating a relaxation station in your classroom for students to de-stress. This station can be stocked with a variety of items, from coloring books, to head phone connected to calming music, and you can even use aromatherapy diffusers to help set the mood for your students. Allowing time for students to reset, could be vital to their success in the classroom. Another example of a brain break is playing an active game as a classroom. Playing games such as musical chairs or Simon Says can give the kids a break from focusing on new material and allow for some humor in your classroom as well. In your classroom, it is important to have a steady structure or routine that your students follow. This is best done during the first couple weeks of school to allow your students to learn the routine. Maintaining a captive audience can be challenging, and sometimes talking over the voices of 30 plus students can be overwhelming. Using hand movements to signal your students attention is a helpful tool to regain attention in your classroom. For example, you can make a signature wave that tells students it’s time to refocus on you, and once they see you doing the wave they will mimic it. This prevents you from trying to yell over a classroom and gives students a chance to take accountability for refocusing their own attention. Another way to regain focus is to use sound with movement. For example, making a rhythmic pattern on the desk for students to listen to and repeat back, or by giving them the beginning of a rhythm and having them finish the ending. The opportunities and possibilities for adding movement into your daily classroom routine are endless and can be adapted depending on the specific needs of your students. 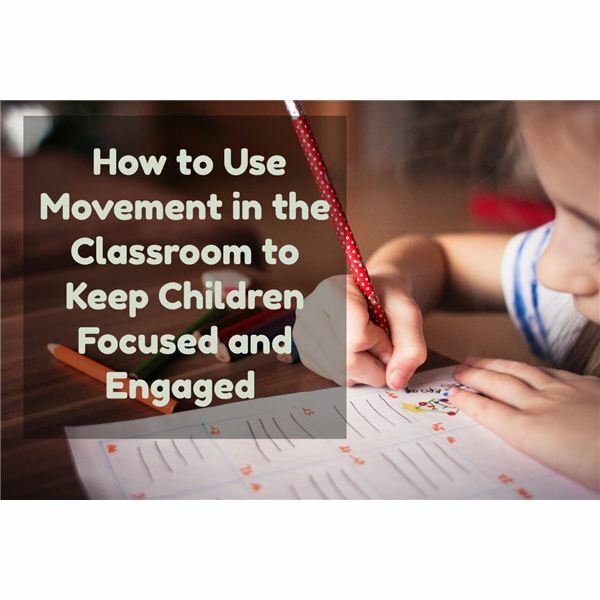 By adding movement to learning, you are engaging your students in ways that will help them retain the information, incorporate a productive way to regain focus among students, and provide kinesthetic dominant learners to feel empowered in a classroom setting.